Samsung's TN panel delivers deep blacks with rich, vivid color and sharp detail. The wide viewing angle lets you view your screen comfortably even from off angles, perfect for team huddles and collaborating with colleagues. The 330 Series features a slim panel at just 2.1" deep and a high gloss black cabinet for a sophisticated look. 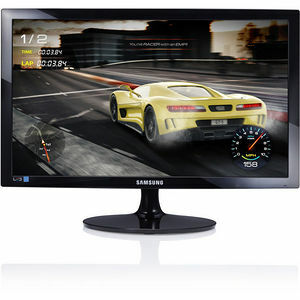 With the touch of a button you can improve your video or gaming experience. Game Mode detects changes in scenes, enhances colors and adjusts contrast so you get a crisp, sharp, blur-free picture with no juddering. And thanks to the ultra-fast 1ms response time, you can always keep up with the pace of business. The 330 Series offers HDMI for high-speed connections and VGA for legacy/analog applications. Activate the Auto Setting to reduce energy use by about 10%. The Eco-Saving Plus feature reduces screen brightness to save power, plus the screen brightness automatically transitions fluidly-reducing energy use even more.